Strawdog Theatre is always a lovely space to walk into; I’m a sucker for small, intimate blackboxes, and the alley seating and soft music playing as you file into Little Women, produced by Brown Paper Box Co., is quite calming. The set (designed by Jeremy Hollis) is simple and straightforward in all the right ways, with just a few leather trunks serving as both scenery and furniture. On the ceiling and by both entrances are panels of darkened wood that are evocative of 1800’s New England architecture while remaining unobtrusive. As the show begins, it is clear that every design element is only present here to draw attention to the actors. And as Little Women is an extremely character-driven piece, this works wonders. We are quickly introduced to Jo March (Tessa Dettman), a young aspiring writer living at a boarding school in New York during the Civil War. She opens with a rollicking musical number where the characters in her story come to life. After some soft encouragement from her kindly professor (Matthew Fayfer), who asserts that drawing from personal experience might strengthen her writing, she flashes back to her childhood in Concord, Massachusetts. From there, we see her and her three sisters growing up together, with all the beauty and frustration that entails. In this ensemble coming-of-age tale, the camaraderie between actors is key – and thankfully the actors play off each other very well, and have plenty of onstage chemistry. That chemistry is combined with spare, effective choreography, strong voices all around, and simple orchestration. The choice to strip away the Broadway orchestra and replace it with a single piano was a smart one – again, it is a technical choice that puts primary focus on the actors. Directors Stephanie Rohr M. William Panek have collaborated with their designers to create a lovely, intimate, and homespun atmosphere. Tessa Dettman as Jo, our fierce and fearless protagonist, is no less than a marvel. Poised yet empathetic, fierce yet insecure, assertive yet capable of great empathy and change, Dettman’s Jo March runs the gamut of all the things a person can be onstage. With a penetrating stare and a singing voice that has the punch of a beautiful brick wall, she gives the show forward momentum when it needs it, while staying deliberate and careful in the slower and sadder parts. I can’t possibly go through the entire ensemble, but they are a strong bunch. In this relatively plotless show, it is on them to take us through each emotional beat effectively, and they do so with grace and aplomb. It’s as if each song is being carefully hand-knit before our eyes; even when the pace occasionally sags, it is still mesmerizing. The first act is lovely and soft and warm. There is nary a glint of cynicism to be found, and we get to watch the March family live, love, squabble, and grow up in a bucolic New England setting – and if at times it seems saccharine, who cares? The show’s crystal clear optimism feels out of place in the current theater landscape, but that’s largely what is so compelling about it. It is a shot of espresso in this dreary, sleep-deprived morning that is our current world. This doesn’t mean, however, there aren’t fascinating paradigms to examine here. A large part of Act One’s conflict comes from Jo’s bold personality and differences from those around her. She is a writer, keen on sharing her extravagant (and occasionally gory) stories with the world. She is hard-pressed to listen to authority. And she has zero interest in marriage, high society, or any of your silly prescribed gender roles. But her sisters? Most of them do want those things. As frustrating as it can be for both Jo and us, the March sisters are mostly content to live and exist within the confines of the patriarchal structures of the era – and because of the simplicity and earnestness with which their struggles are presented, it’s hard to root against them. You can’t begrudge these women for wanting merely to attend a ball or fawn over boys, because you’re fawning right along with them. And why not? Boys are cute, ask anyone. This is all the more heartbreaking when their struggles bump up against Jo’s, as she strives along what we think of as a more straightforwardly feminist path. But even this is uplifting in the way it’s presented, because her family never shames her for wanting more. Understanding someone else’s viewpoint is all well and good, but nothing beats consistent love and support from those close to you. If Act One warmed the cockles of my shriveled Grinch heart, Act Two proceeded to rip that heart out of my chest and tear it to shreds. Growing up, Jo soon discovers, is more difficult than it is possible to imagine. Making progress in the world is harder. And crippling personal loss doesn’t help either. Throughout it all, simple acts of kindness – from within and without the March family – serve as tethers, pulling us and Jo out of the dark. The tech elements’ single-minded focus on the actors strengthens the punch of each devastating scene, and the happiness and sadness is palpable and desperate and clawing. For every powerful crying moment in this show, there is a hugging moment that is ten times stronger. 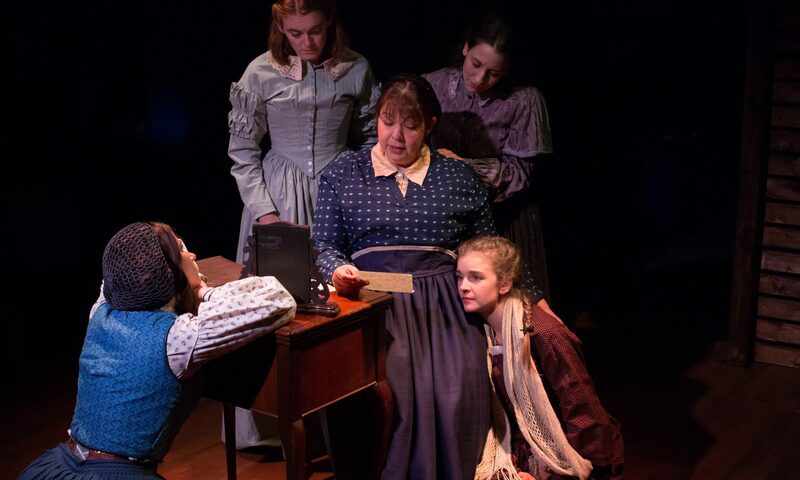 That this play seemed saccharine to me on first glance is an indicator of just how sorely needed Little Women is. Not only is it a balm, it’s an instruction manual on how to survive tough times.